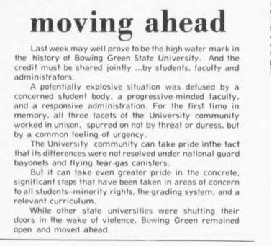 The BG News has served as the voice of the students at Bowling Green State University since 1920. The student-published newspaper contains a wealth of information and news relating to contemporary trends, campus events and the impact and impressions of national events within the context of student life. This collection contains PDF copies of select articles from the BG News. All articles featured in this collection are fully text searchable, either within the accompanying "Text" metadata field or within the PDF files themselves. Complete digital copies of the full run of the BG News, including every issue from the beginning of the paper in 1920 to the present day, are avaialble in the University Libraries' ScholarWorks repository. Please visit the BG News collection in ScholarWorks to view digital copies of entire issues. 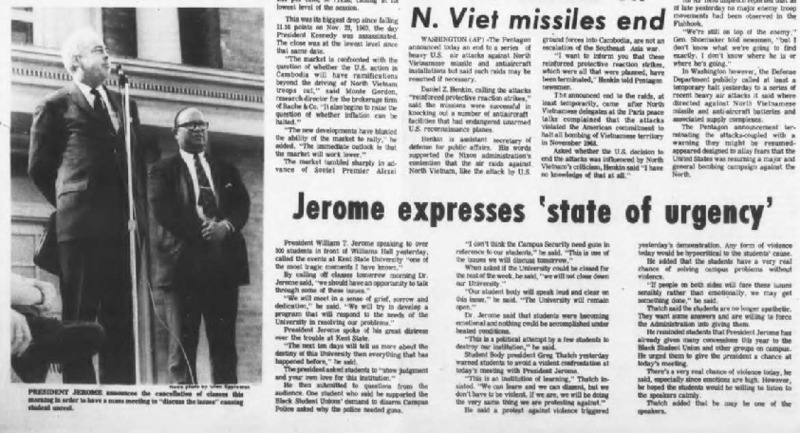 "Jerome expresses 'state of urgency'"
An article in the BG News describing BGSU President William T. Jerome's address to students in the aftermath of the 1970 Kent State Shootings. 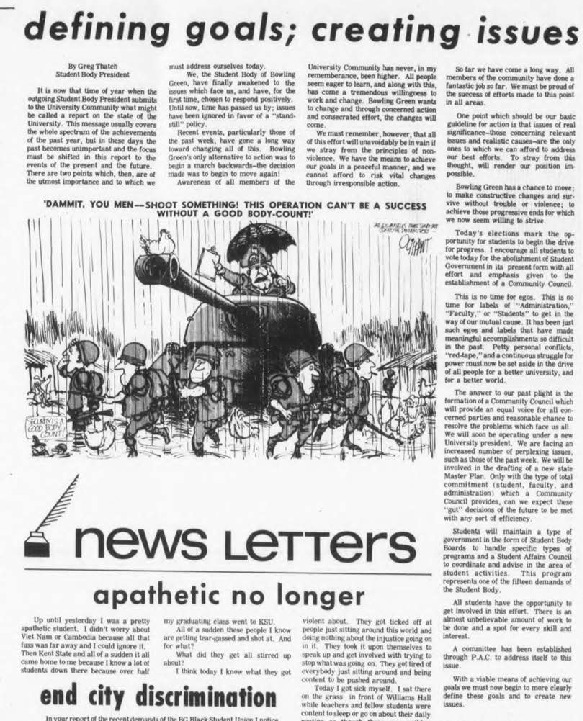 An editorial in the BG News thanking students for their participation in the aftermath of the 1970 Kent State Shootings and encouraging more participation in the future. 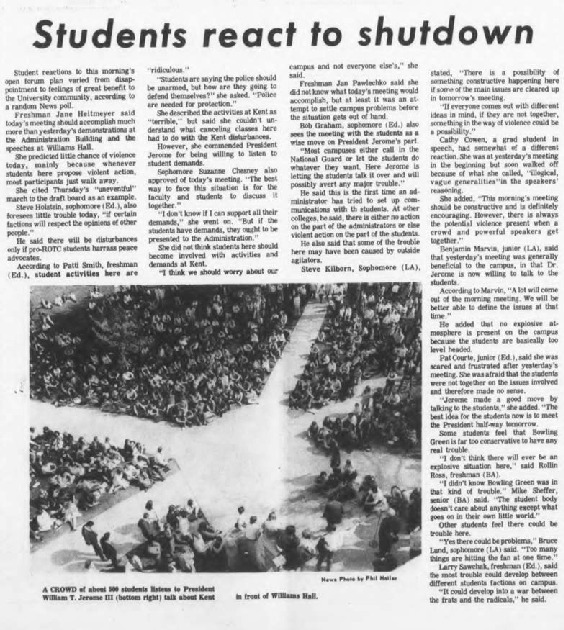 An article in the BG News encompassing numerous perspectives from BGSU students in the aftermath of the 1970 Kent State shootings. 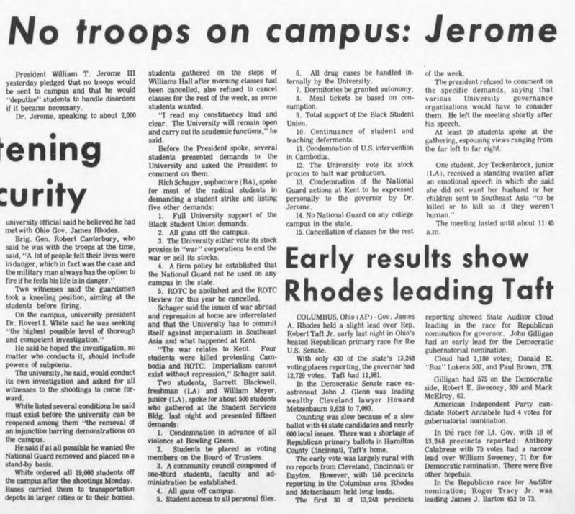 "No troops on campus: Jerome"
An article in the BG News describing a meeting between BGSU President William T. Jerome and the Faculty Senate at which both parties addressed Black Student Union Demands and the 1970 Kent State Shootings. 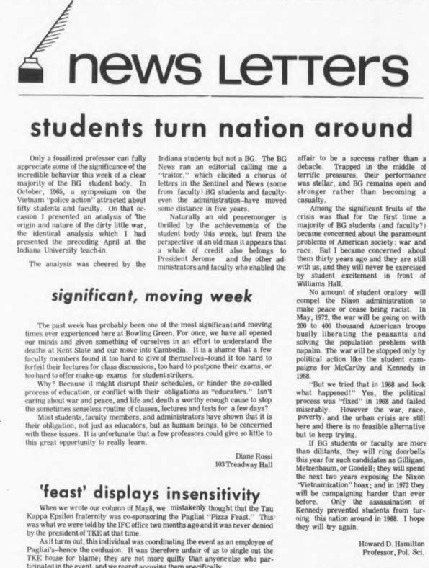 An editorial in the BG News notifying readers about the results of a candlelight march held in downtown Bowling Green, Ohio mourning the victims of the 1970 Kent State Shootings. A column in the BG News by BGSU Student Body President Greg Thatch appraising student protests and requesting that constructive change continue. 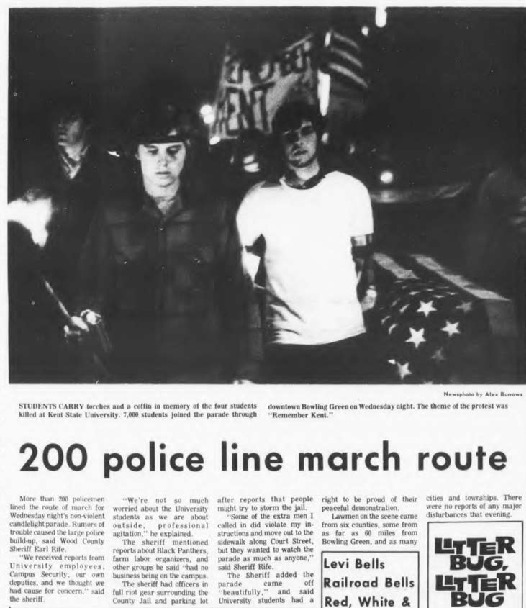 "200 police line march route"
An article in the BG News discussing police presence at a candlelight march held in downtown Bowling Green, Ohio. 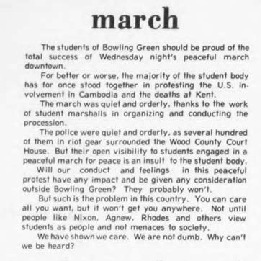 A letter to the editor of the BG News from BGSU political science professor Howard D. Hamilton describing the benefits of student activism. 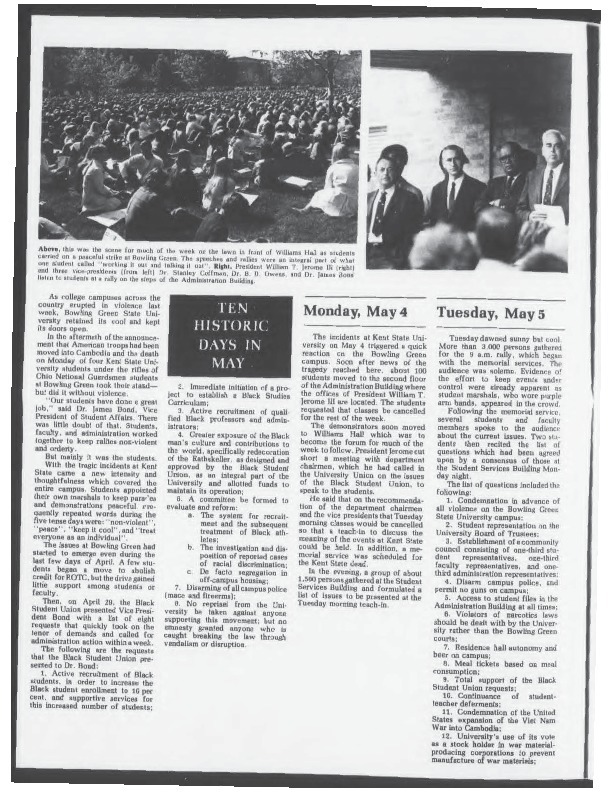 "Ten Historic Days in May"
A series of articles and photo features describing the events taking place on BGSU's campus in the aftermath of the 1970 Kent State Shootings.